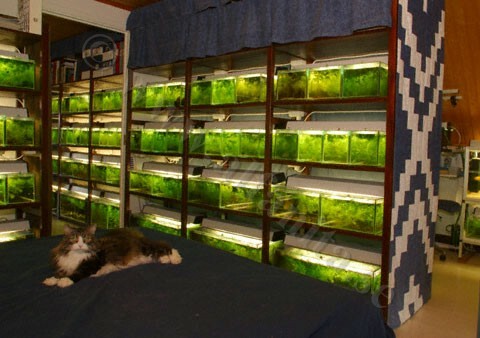 How to get 160 aquariums into the flat, and still have room for the bed ?? This is how we did it (back in 2005. There have been LOTS of changes since then). This is what you meet when you enter our "fish room". 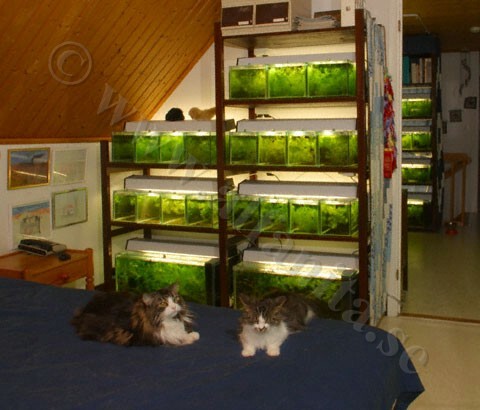 The "fish room" consist of a hall and our bed-room, and is located on the second floor. This means that it gets quite warm in the summer, and that can only partly be put right be leaving the door to the balcony open. It also means that we can never get a lower temperature than the temperature outside, and that is a limitation when it comes to choosing species. That is something we have learned the hard way!. At this level we have "3 on a shelf" tanks (about 18 litres/4 gallons) with a pair or a trio of Fundulopanchax gardneri or larger Chromaphyosemion. 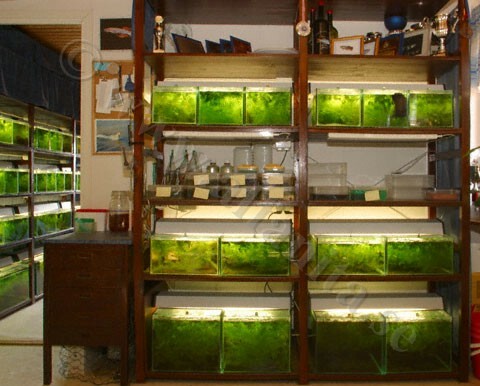 At this level we have "4 on a shelf" tanks (about 14 litres/3 gallons) with a pair or a trio of small Fundulopanchax, Aphyosemion or Chromaphyosemion. 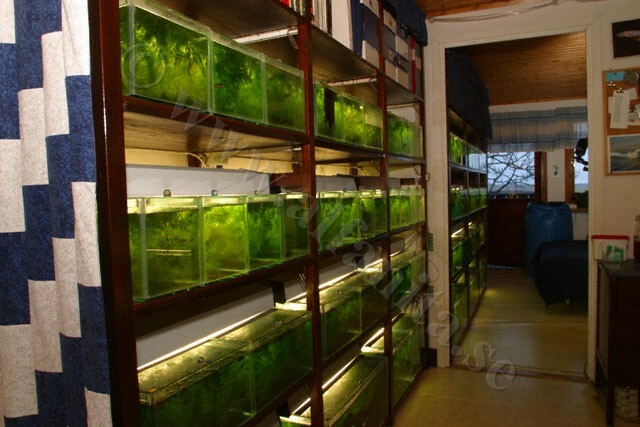 At this level we have "2 on a shelf" tanks (about 25 litres/6 gallons) with spawning groups or juveniles. At the bottom we have the largest tank (45 litres/11 gallons and 85 litres/21 gallons), and on this shelf we have Fundulopanchax nigerianus "Lokoja", Fp. gardneri mamfensis "Talangaye, CSK 95/6" and Fp. gardneri gardneri "Nsukka"
At this level with "3 on a shelf" tanks (about 18 litres/4 gallons) we have pairs or a trios of Fundulopanchax gardneri, Epiplatys or Chromaphyosemion.  At this level we have "4 on a shelf" tanks (about 14 litres/3 gallons) with a pair or a trio of Fundulopanchax, Aphyosemion or Chromaphyosemion. At this level we have "2 on a shelf" tanks (about 25 litres/6 gallons) with spawning groups. At the bottom we have the largest tank (85 litres/21 gallons and 45 litres/11 gallons), and here we have Fundulopanchax nigerianus "Misaje", Altolamprologus spec. "compressiceps shell", Fp. spec "Korup" and Chromaphyosemion riggenbachi "Nkwo, 97/1"
Throughout the years there has been some awards. In these "3 on a shelf" tanks we keep Fundulopanchax gardneri lacustris "C89/5", Chromaphyosemion bitaeniatum "Zagnanado" and Fp. gardneri gardneri "Lafia"
Here we hatch and keep the smallest fry and hatch artemia. 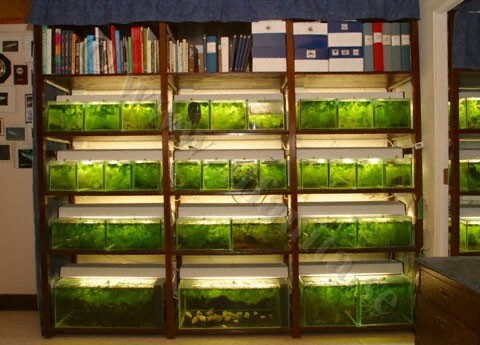 At this level we have "2 on a shelf" tanks with spawning groups or juveniles. At the bottom we have four 45 litres/11 gallons tanks. In these we keep Fundulopanchax deltaensis, Fp. gardneri lacustris "C89/5", Lacustricola bukobanus "Mityana. UGJ, 99/17" and Fp. gardneri mamfensis "Ossing"
This is our cats Daisy and Esmeralda resting on our bed. 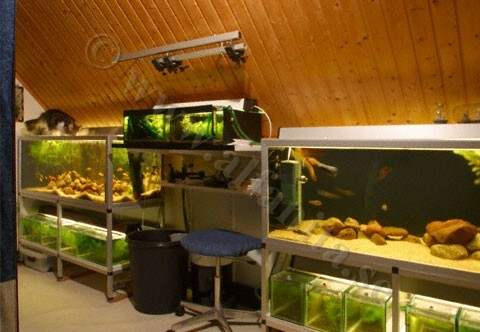 At this level we have "3 on a shelf" tanks with a pair or a trio of Fundulopanchax gardneri or larger Chromaphyosemion. In these "4 on a shelf" tanks we keep juveniles of all kind. 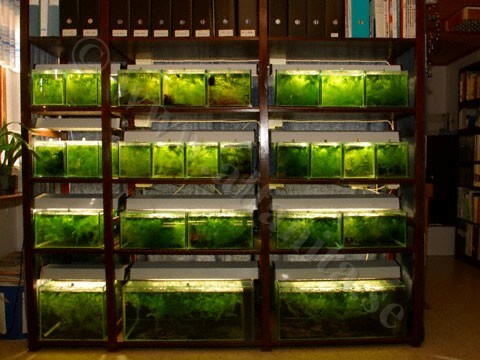 In these "4 on a shelf" tanks we also keep juveniles of all kind. In these larger tanks we keep larger juveniles or large litter of for instance Fp. rubrolabialis "Malende" and Fp. filamentosus "Ouidah, Rep. of Benin". Our cat Daisy willingly pose on the bed. In these "3 on a shelf" tanks we keep different Fundulopanchax and Chromaphyosemion species, and also Aplocheilus kirchmayeri "Goa 91"
In these "4 on a shelf" tanks we keep different Aphyosemion and Chromaphyosemion species. In these "2 on a shelf" tanks we keep different spawning groups of Aphyosemion, Chromaphyosemion, Fundulopanchax and Nothobranchius. In these three 85 litres/21 gallon tanks we keep Chromaphyosemion splendopleure "Moliwe, GPE 90/5", Rivulus igneus "Sentier du Rorota, GML 96/2" and Fundulopanchax arnoldi "Ughelli, TR 01"
In the top to the left we have 8 small aquariums with Moina. 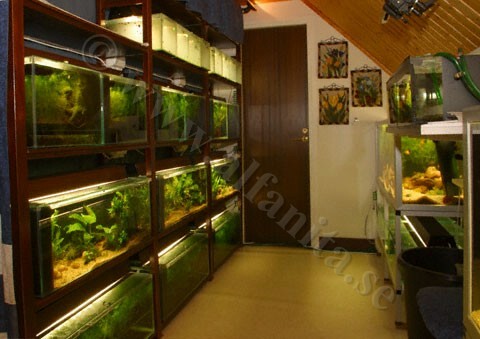 At this level we have six 32 litres/8 gallon tanks with groups of Fundulopanchax, Chromaphyosemion and lampeyes. At the middle level we have three 65 litres/16 gallon tanks. Among other species we keep Pelvicachromis species, the rainbow fish Pseudomugil furcatus and livebearers, all mixed with killies. At the bottom we have three 65 litres/16 gallon tanks with groups of lampeyes and Fundulopanchax. We also have some Pelvicachromis species here. These tanks also acts as water bowl for our cats. Between the 2 large tanks we have our both photo tanks. In the ceiling/on the wall you see the rail that holds the flashes. Beneath the large tanks we have some tanks of mixed size. Here we keep a pair or a group of fishes that like a bit lower temperature (this is the coolest place in the fish room), or some males growing up to be photo models. In the kitchen we have this 720 litres/170 gallon tank with cichlids from Lake Malawi. The interior consists of slate that's piled up all from the glass, and they are not glued together. This means that one has to be very careful when one builds it up, so it's really stable. In this tank we keep Cynotilapia afra "Còbué", Labeotropheus trewavase "Manda", Labidochromis hongi and Pseudotropheus msobo "Magunga"
In the living room we have this 400 litres/100 gallon community tank. In this we keep Pterophyllum spec. "Peru", Pelvicachromis taeniatus "Ogelle", Trichogaster leeri, Girardinus metallicus and some males of Chromaphyosemion alpha "Santa Clara, GJS 00/34". Last but not least we have this 250 litres/60 gallon tank with the snakehead Channa gachua "TH 03/2" in our son Andreas's room. Here is a grown up pair and a couple of hundred juveniles.